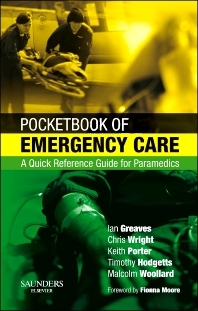 The Pocketbook of Emergency Care is the first text designed for use by the professional paramedic at the roadside. The contents are formatted to be easily accessible when specific informatoin is required in an emergency situation. Although arimed at paramedics it is a useful, practical handbook for emergency medical technicians, advanced first aiders, combat medical technicians and practitioners of emergency medical care in remote and rural environments. The book covers the immediate management of acute medical emergencies, major trauma, minor injuries and environmental problems as well as covering the interaction with other emergency services and coping with major incidents. The Pocketbook is an up-to-date synopsis of pre-hospital emergency medicine and includes the most recent European Resuscitation Council algorithms along with recent military medical advances in the management of major trauma patients. The text is based on the popular Emergency Care Textbook for Paramedics, also published by Saunders Elsevier, which can be used as a reference text in conjunction with the Pocketbook.